In January 2009, it is much about layering... The weather is cold (in much of the USA), and adding layers is a great way to stay fashionable and warm. 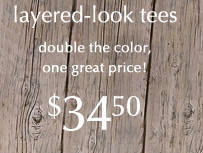 Check out the layered-looks at coldwater creek. By the way, you can also read Coldwater Creek News, or check out information on a career at Coldwater Creek.